As you can see I have the site's colours changed from blue to green for the internationals, but if I could just cling to the Leinster goggles for one final statement...as if the season wasn't 'perfect' enough, having gotten the fourth star just how fitting is it to round things off with a three match series between the coaches responsible for the other three? OK goggles switched back to green, I promise. Every summer when these three-match jaunts to the southern hemisphere come around we always ask ourselves 'what we want from the tour'. It's a fair question and one I have asked many times myself, yet when you think about it, it's approaching the series from something of a defeatist position. This is sport we're talking about. Ireland are slated to play three test matches. What else could we possibly want short of three wins? So if we're asking the question "what do we want", I have to assume we're looking ahead for silver linings on the assumption that we're going to lose a match or two, or three? Naturally I'm being a bit facetious there. I get the whole 'need to blood squad players' thing as much as anyone, but what I want to point out in this preview is that there has to come a time when we take a step back from the micromanaging and start asking questions like - "Hang on, we just won a Grand Slam and deservedly so. Who's to say we can't go to Oz and keep that winning streak going?". One of the leading suggestions was to leave Johnny Sexton at home so we could develop a few alternatives should he not be available in 2019. Again, this can be seen from two sides. Sure, leaving him at home has its advantages, but are they not outweighed by the positives of bringing him...the squad used to having him around while travelling and, oh yeah, having him on the park? As far as I'm concerned, Sexton has earned himself the status of..."If he wants to play, he plays." And before you start wondering if I still have the blue goggles on, the same goes for other senior players too like Rory Best and Peter O'Mahony. Having said all of that, Sexton has been rested from starting this opening test, a powerful statement by Joe Schmidt that keeps Joey Carbery firmly in the spotlight that was thrust on him last week with his controversial provincial move. I'm beginning to wonder if Joe's plan for 2019 merely involves giving chances to fringe squad players. Maybe he has also developed a coaching model whereby no matter what combination of 23 players are fit and available on Monday, a winning gameplan can be constructed in time for the Saturday. And this match in particular will be the perfect test case for that theory. You can be sure Carbery won't be sent out there as a placeholder to keep the scores close until the final quarter so Sexton can bring things home. He'll be expected to put his own stamp on proceedings (I'm thinking little jinking runs of his own plus the odd chip and chase) and it will be interesting to watch his decision-making in different situations, as well as his rapport with new team mate Conor Murray. But that's only a part of what is fascinating about this encounter. When I (reluctantly) wrote up Leinster's heavy defeat in Galway I pointed out how rough it would be on Bundee Aki not to have him start Ireland's next match after all the hard work he put in during the Six Nations, and with him and Henshaw in place, our defensive structure has a solid base. Then in the forwards, while we have a load of strong ball-carriers, with the likes of Messrs Pocock and Hooper on the opposite side they are only going to be as good as the players in support for clearing out and such. Discipline, both in keeping the penalty count low and in executing set-pieces on our own ball, is something that Joe wants to take for granted, and so should we. The one area we could have problems is in high tackles as we tend to gamble to force turnovers and prevent offloads, but hopefully this won't affect us too much. I have to admit I don't know a whole lot about the Wallabies as my Super Rugby viewing time has been minimal this year. 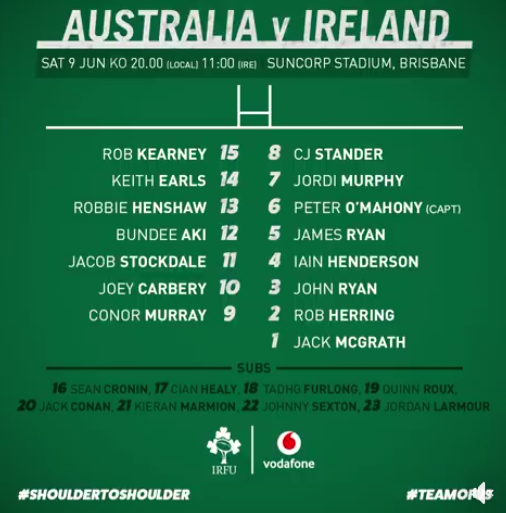 But one thing we will have to watch out for...the box kicks have to be spot on with Folau in the backfield though in Conor Murray we have arguably the best in the business. The bookies say it will be a close one and interesting they shade the spread in our direction by a point. With the quality of our bench (or 'finishers' as Cheiks calls them) I agree we have enough to finish ahead on the scoreboard but I actually think we have enough talent starting the match to produce a bigger margin...I'll go for an ambitious 5-7 points. Like I say, if a Grand Slam doesn't give you some confidence, nothing will! Reserves: Tolu Latu, Allan Alaalatoa, Taniela Tupou, Rob Simmons, Lukhan Tui, Pete Samu, Nick Phipps, Reece Hodge.